So much more than just a practice amp, this is a killer tool for beginners and pros alike. Incredibly versatile. Great sounds. Loads of fun! Footswitch should be included for the price. 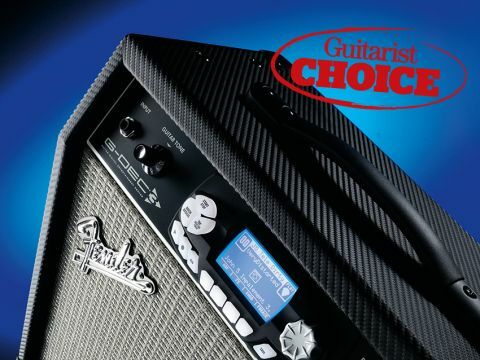 Like us, many of you will probably have less-than-fond memories of your first practice amp. Often a single-channel affair, even those graced with such luxury features as an overdrive switch tended to rasp harder than a surform in a wasps' nest - the AM radio in your parents' kitchen probably had a richer bottom-end response. Hang on a minute though, it's 2010. Most of us are walking around with telephones in our pockets that allow us shoot video, access the internet and listen to our entire record collection. And thanks to AmpliTube for iPhone, we'll soon be using our mobiles as headphone amps too. That's considerably more practical, not to mention rocking, than anything Tomorrow's World ever promised. "Anything that makes practising this enjoyable is a winner in our book." It stands to reason then that the touchscreen generation expects more from a practice amp than such trifling functionality as merely amplifying the sound of electric guitars. While the likes of Vox and Line 6 have packed a smorgasbord of sonic treats and tricks into their entry-level amps over the last few years, it was Fender - whose fifties Tweed and sixties 'Blackface' designs are still the high watermark for most tonehounds - that launched the most complete do-it-all practice solution yet in 2007. More than just a practice amp, the original G-DEC was a 'Guitar Digital Entertainment Center', crammed with innovative features and impressive enough to get a four star review. But digital technology moves fast. Just as this year's king of the smartphone hill won't look quite so clever in the not-too-distant future, three years on, the first incarnation of the G-DEC sounds a little dated with its MIDI muzak backing tracks and sometimes over-egged sounds that just don't get the adrenaline pumping. Enter G-DEC 3. This time around, things are very different. G-DEC 3 features banks of sounds and backing tracks created in the studio by genuine Premier League rock, metal, blues and country stars such as Eric Johnson, John 5 and Brad Paisley, along with members of Fall Out Boy, Def Leppard, Anthrax, Sepultura and many more. It's easy to see how this makes G-DEC 3 the next logical step for budding players whose appetites have been whetted by the wildly popular Guitar Hero and Rock Band video games. Straight out of the box, you're just a twist of the large Encoder knob away from being able to jam along with a range of backing tracks, and there's enough variety to suit players of almost any persuasion. Not only is each backing track matched to an appropriate preset guitar tone - although you can change it if you want to - but it can also be set up to loop perpetually. This means that you can carry on trying to perfect that tricky lick over and over again without having to reach for the amp controls and risk breaking your concentration - a nice touch. As a practice tool, G-DEC 3 is undoubtedly impressive, but you might be forgiven for assuming that the closed-back combo's 10-inch driver and a power rating of 30 solid-state watts confine it to the domestic environment only, even in this, the larger of its two incarnations. However, stereo jack line-outs mean that hooking the amp up to a PA system and getting a satisfying stereo spread is simple. If you don't need to compete with a loud drummer, the 30-watt GDEC 3 is a viable gigging option for smaller stages. The onboard SD flash memory card reader allows you to save and recall a potentially limitless library of customised sounds and backing tracks via Fender's FUSE software and online community. As a result, this might just be the ultimate do-it-all solution for the many one-man-band guys on the live circuit who sing and play along with backing tracks. Fender's FUSE software is the key to G-DEC 3's massive versatility. Simply hook up the amp to your computer via USB, install the software and begin tweaking amp model and effects parameters. The software also allows for effects combinations that are impossible to achieve via G-DEC 3's control panel, such as putting modulation and delay 'in front' of the amp in the signal chain. Once you've sculpted your sound, which is a simple task for anyone who has used an amp modelling software package, you can save it in one of 100 slots in the amp's onboard memory or store many as you like on an SD card. Then the real interactivity starts. Register at fuse.fender.com to join the community and swap sounds and backing tracks with hundreds of guitarists across the globe. With the rhythm section for a whole live set saved on an SD card, you only need your guitar and the G-DEC 3 and you're set to plug into the PA and go. The only downside is not being able to blame the bassist for bum notes. Importantly, the front panel's 'band level' control allows you to tweak the level of your backing track relative to your guitar sound. Even when working with the backing tracks that come pre-loaded at the factory, fine tuning of the band level is required on a track-by-track basis as you'll find that some of the guitar tones cut through the mix more than others, while the perceived overall level of the backing tracks varies. Thanks in no small part to the high-frequency tweeter that accompanies the amplifier's regular 10-inch speaker, reproduction of the backing tracks without a PA is bright and three-dimensional with an impressively rounded, firm bottom-end. But what's really interesting is just how well the onboard guitar tones work in the context of a full band mix. This is a welcome reminder that context is everything; sounds that raise eyebrows in isolation can work perfectly when the backing track is rocking away. Detailed analysis of G-DEC 3's individual modelled amp tones is largely irrelevant due to the sheer amount of tone-shaping that the FUSE software offers. If you don't like it, you can tweak it. No, it's never going to sound exactly like an original '65 Deluxe Reverb, but to split hairs over authenticity is to miss the point; this is an amp about fun and functionality. Our only real gripe is that to get the most out of G-DEC 3 in performance, whether that's using the phrase sampler, playing onstage, or jamming in a garage with friends, you need to pay extra for the UTL-4 footswitch (£42.39). Otherwise, G-DEC 3 is solidly built, with an easy-to-understand, clearly laid-out set of controls. As a result, the learning curve is gentle, but there's more than enough depth and flexibility available should it be required. Anything that makes practising this enjoyable is a winner in our book.